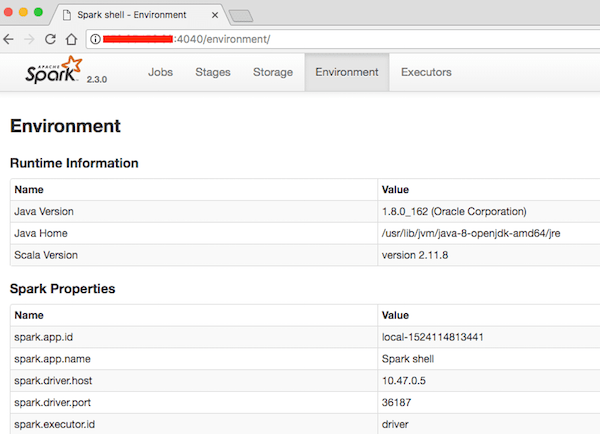 In this tutorial we will show you how to install Apache Spark on Ubuntu 18.04 LTS. For those of you who didn’t know, Apache Spark is a fast and general-purpose cluster computing system. It provides high-level APIs in Java, Scala and Python, and also an optimized engine which supports overall execution charts. It also supports a rich set of higher-level tools including Spark SQL for SQL and structured information processing, MLlib for machine learning, GraphX for graph processing, and Spark Streaming. This article assumes you have at least basic knowledge of linux, know how to use the shell, and most importantly, you host your site on your own VPS. The installation is quite simple and assumes you are running in the root account, if not you may need to add ‘sudo’ to the commands to get root privileges. I will show you through the step by step installation Apache Spark on a 18.04 LTS (Bionic Beaver) server. Step 3. Installing Apache Spark on Ubuntu 18.04 LTS. Step 4. Accessing Apache Spark. Apache Spark will be available on HTTP port 4040 by default. Open your favorite browser and navigate to http://yourdomain.com:4040 or http://server-ip:40404 and complete the required the steps to finish the installation. Congratulation’s! You have successfully installed Apache Spark. Thanks for using this tutorial for installing Apache Spark on Ubuntu 18.04 LTS (Bionic Beaver) system. For additional help or useful information, we recommend you to check the official Apache Spark web site. Related Posts of "How To Install Apache Spark on Ubuntu 18.04 LTS"